St. Mary Catholic School is proud to announce that the Wichita Diocese awarded it's prestigious Banner School Award in 2016 to our school! Only two school in the diocese were chosen for this award and it's the second time in three years that St. Mary has been chosen. We thank you for all of your help and support of our school and share this award with all of our friends and benefactors! Bishop Kemme visits St. Mary Catholic School the first week of school on Friday, August 21, 2015. Below are links for the Wichita Diocese Catholic School survey (both English and Spanish). Please take time to complete the survey (both mom and dad) to give feedback so we can use this information to help the school and diocese. You can fill this survey out before or after conferences or another time, but please take time to do so. We value your input. A continuación encontrará enlaces para la encuesta Wichita Escuela Católica Diócesis (Inglés y Español). Por favor, tómese el tiempo para completar la encuesta (tanto mamá y papá) para dar información para que podamos utilizar esta información para ayudar a la escuela y de la diócesis. Usted puede llenar esta encuesta a cabo antes o después de las conferencias o en otro momento, pero por favor, tómese el tiempo para hacerlo. Valoramos su opinión. The Salvation Army is helping families with school supplies. You can fill out an application at the office in Newton at 208 W. 6th St. or call 283-3190. This is for families who qualify for free/reduced lunches. Simply fill out the application by Friday, July 17 and bring a school supply list. A copy of our school supply list is under handbook under the about tab. A copy is available at the Wal-Mart store. We will also have a limited number of school supplies available at final enrollment on Sunday, July 26 from 9am-1pm in the school gym. Please make sure that your child has the necessary health forms, immunizations and sports physicals up-to-date before school begins. Here is one opportunity. 316-264-8974 Guadalupe Clinic is a donation based clinic that services the uninsured and medically underserved. Registration forms will be available in advance through your child’s School Office and also available on site both dates. PLEASE bring your child’s immunization records and insurance information. Thank you for supporting the 2015 school auction. Because of your generous giving, we were able to order and install new bleachers in our gym this summer. Below are pictures from the initial tear out of the old bleachers with an empty gym to the final completion of the new bleachers with ADA seating included. Summer Meals will be served this summer from June 8th through July 24th. Breakfast will be served from 8:30 to 9 am at Sunset Elementary. Lunch will be served from 11:30 to 12:30 pm at Sunset Elementary. An evening meal will also be served again this year at Newton High School. Enter through the west entrance from 5 to 6 pm. Children ages 1 through 18 eat free and adult meals are available for purchase. For more information on this program, please call Peace Connections at 284-0000. St. Mary Catholic School has added to our gardens. Thanks to a KSDE health grant, our school was able to put in two raised garden beds this spring. The 4th and 5th grade classes helped with the planting with pictures below. St. Mary Catholic School was chosen by the athletic directors from the Catholic Schools Activities League for the 1st Annual Jim Jerome Sportsmanship Award. This award will be presented yearly to one school in the league that exhibits good sportsmanship, appropriate fan support and character throughout the year. To see a picture of our students with this award and read the article from the Newton Kansan, click here. A student is not an amalgam of test scores and demographic information. Each student is a unique and irrepeatable human being with gifts and challenges that cannot be reduced to a transcript, a report card, or a trophy case. In a world dominated by sound bytes and competing statistics, how does a school foster the growth of each individual beyond test scores? Much research has been done highlighting the value of a school as a community versus a school as an institution. There is, of course, no denying that schools are institutions of learning. Students take required courses. Parents comply with compulsory education laws. Teachers must maintain appropriate licenses. The state constitution mandates a system of schools. Any school that satisfies all those obligations is likely good enough. As the saying goes, however, good enough never is. Research that runs back five decades highlights the power of a network of support (sometimes called social capital) to maximize student growth and achievement. Starting with Andrew Greeley’s quinquennial surveys, highlighted by the landmark (and controversial) studies of Dr. James Coleman, and punctuated by the work of Bryk and Holland, it is clear that if we want children to reach their full capacity, we must surround them with a community of support. Why are Catholic Schools particularly suited to do this? v Catholic schools are parochial. They anchor neighborhoods. They are built, funded, sponsored, and filled with families from individual Catholic parishes. This site-based ownership fosters high expectations and local pride. It sometimes seems as though half of west Wichita has its roots at St. Joseph parochial school while eastsiders detail their lineage from Blessed Sacrament. Recent research in Chicago even found that where there are Catholic grade schools in neighborhoods, crime rates are lower. v Catholic schools are small. Research is inconclusive at best about the benefits of smaller class sizes, but there is much more evidence that students from smaller schools consistently achieve higher than students from larger schools. With K-8 enrollments averaging about 200 students and secondary school enrollments ranging from 240 to 1,160; Catholic schools are large enough to provide essential services while small enough that an individual student can’t get lost. In a smaller school, a student is a person, an individual, and not just a number in a lottery of 120-150 Grade 4 students. v Catholic schools make big schools smaller. Even in larger Catholic schools, one finds that the school-within-a-school concept downsizes the school. Typically a pre-kindergarten through Grade 8 school is divided into three sections: early childhood (PK-K); primary (Grades 1-5) and middle school (Grades 6-8). In this way, the developmental needs of each group of children can be addressed separately within the context of the larger school. v Children stay in the same school for up to ten years. Catholic grade schools offer everything from pre-school through Grade 8 in one school. Over that ten year period, not only do parents get to keep their children in the same school for longer; they also get to know the same teachers, the same families, and the same facilities. The teachers get to know the children better because they know the family longer. v What are the results? In the close-knit relationships that are formed in a decade or more in the same place, it is more possible to provide an education that will challenge children because the teachers know them better, and parents know the teachers better. Teachers can choose methods to develop and maintain a love of learning. Of course, in a Catholic school, teachers can build on the moral foundation laid in the home and teach children the “why” of living and not just the “how” of learning. It follows naturally that in a Catholic school, formation extends to emotional and social development as well. We believe that this wholistic formation best prepares students for adulthood, college, career, and family or whatever their vocation may be. I have long suspected that while parents care about grades and test scores, they care even more about foundational behaviors: motivation, engagement, study habits, healthy relationships, respectful and responsible attitudes. Not so easily measured, perhaps, but unquestionably important. I believe that Catholic schools have had their great success because of the network of support that the entire Catholic community provides to the children of their parish in the intimate setting of a parochial Catholic school. Video of the groundbreaking for the 2011 edition to St. Mary Catholic School filmed by Pat Breckunitch. Below, the final seconds tick off the clock as St. Mary defeats Resurrection in the championship game for 1st place 28-24! Congratulations! The 2012-13 St. Mary Catholic School calendar has been finalized. A copy of the calendar was sent out in the summer packet. St. Mary Catholic School graduate Abbey Pomeroy returns to St. Mary during Catholic Schools Week as Miss Rodeo Kansas. 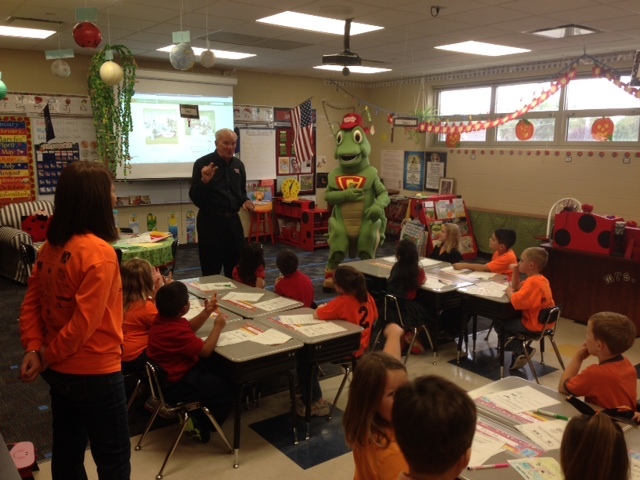 Kass and Carol visited St. Mary from the Harvey County Parks Department. 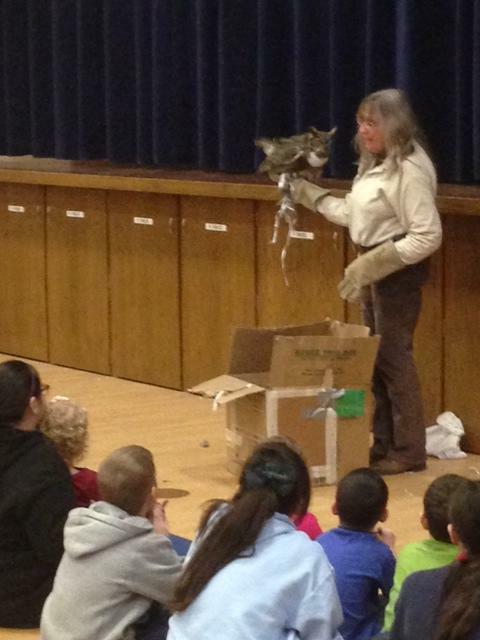 Below are pictures of the great horned owl and snake that were brought to share with the students. Many thanks! The 2012-13 post season volleyball tournament schedules are now posted. Click on the sports link and then on the right side under documents you will find the 7th and 8th grade tournaments. There is an admission fee for tournaments and all tournaments are double elimination. 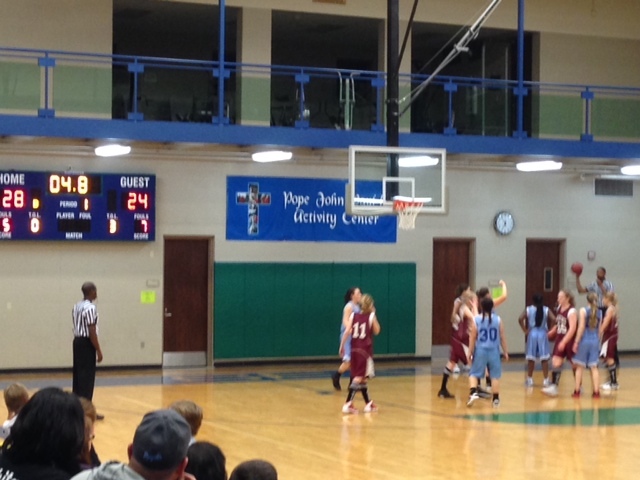 The 7th grade team starts Monday, October 1 and the 8th grade team has their first game, Saturday, October 6. The Wichita Diocese has asked for the following information to be available to our parents. Kansas State Department of Education Invites all Kansans to Join the Conversation! TOPEKA – The Kansas State Department of Education today launched Join the Conversation!, an online tool available at http://standards.ksde.org that provides Kansas citizens the opportunity to study and submit feedback on the state’s current English language arts and mathematics academic standards. The standards, known in Kansas as the Kansas College and Career Ready Standards, were adopted by the Kansas State Board of Education in 2010 and represent what students should know and be able to demonstrate at each grade level. Kansas has had content standards for more than 20 years and conducts a review of its standards every seven years. The current standards will be up for review in 2017. The goal of Join the Conversation! is to collect public input on each of the mathematics and English language arts standards at every grade level and provide that feedback to help guide the work of the standards review team. The online tool will be available until October 30, 2015 for teachers, administrators, parents, students, higher education representatives and all others who are interested to read the standards by grade level and content area and provide feedback. Participants may make suggestions on moving a standard to another grade level, creating a new standard, or rewriting a specific standard. Comments provided about specific standards will be evaluated by a team of Kansas educators from all levels specializing in the specific content areas. Any changes recommended by this team will be presented to the Kansas State Board of Education for its consideration. To Join the Conversation!, go to http://standards.ksde.org. The St. Mary Fun Run is coming up Saturday March 28, 2015. Like last year, you can register online at 2015stmaryfunrun.eventbrite.com. A small fee does apply. We are excited to have tech (dry-fit) style shirts again this year!! If you are interested in just purchasing a shirt, cost is $8. Adult sizes XS-2XL, youth sizes S-XL. Sizes 3X-6X are available for $10. Entry forms and notes will be going out to students soon! Entries/orders received by March 10 will have shirts by the Fun Run. We will place a second order of shirts after the event if you miss the deadline. The artwork design was by 7th grade student Rafael! Lines form to try out the new teeter totters! Thank you to Magdalen for this new playground piece of equipment. St. Mary Receives Awards for High Marks! For t he 2011-12 school year, St. Mary was awarded the Catholic Diocese of Wichita St. Robert Bellarmine Award in Religion, Reading, Mathematics and Science! In religion, 95.3% of the students met standard or above on the diocesan test. In reading, 97.7% of the students met standard or above on the state assessment. In mathematics, 93.1% of the students met standard or above on the state assessment. In science, 100% of the students met standard or above on the state assessment. In social studies, 92.0% of the students met standard or above on the state assessment. The state targets were 87.8% in reading, 86.7% in mathematics, 71.0% in science and 70.0% in social studies. St. Mary exceeded the targets in every subject. Congratulations! The Kansas State Department of Education released the standards of excellence for 2012. St. Mary Catholic School earned 16 awards! All St. Mary Catholic School students and families are asked to attend Mass at Our Lady of Guadalupe, Sacred Heart or St. Mary parishes. Students are asked to show support for Catholic education by wearing your school uniform. We need help at 7pm on Sunday, January 25 to setup tables and chairs for our family lunch in the school gym. 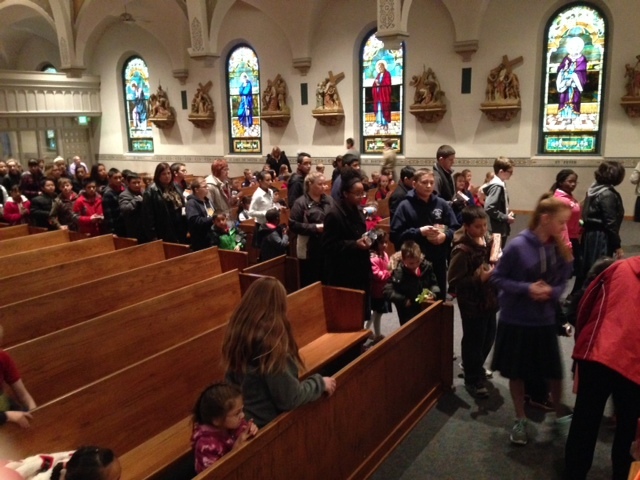 Join us for our all-school Mass, kicking off Catholic Schools Week at 8:00am in church. Cheerleaders will bring up our school banner before Mass. Monday will be Family Lunch Day! We would like to invite family members to join us for lunch. Lunch will begin at 11:00am followed by a guest speaker, Ron Willis, who will bring his great story telling talent to St. Mary. His program will be from approximately 11:45-12:30pm. The cost for lunch is $3.50 for adults and children $2.00. You do not need to RSVP and you can pay at the door the day of the lunch. Please check in at the school office. It will be a white chili dinner. Students will be charged through the normal lunch program. Students may wear crazy socks/shoes with uniforms. Tuesday will be Crazy for our Friends Day! In the morning we will have children’s adoration with Fr. Anthony from the St. John’s order. Classes will make cards for those that help the school such as cafeteria staff, recess volunteers, coaches, maintenance and cleaning staff and more. Students may dress as their favorite saint on this day. We will take a group picture. A cheerleader led assembly will begin at 2:15pm in the gym. Wednesday is Student Appreciation Day! Join us for Mass at 8:00am. A religion bowl contest will be set up for buddy classes. The friendly competition will take place at 9:30am in the gym. Parents are welcome to attend. Students will have a slippers and sweats (no writing on the bottom) or jeans day including a movie with popcorn in the gym at 1:15. What a great day to be a student at St. Mary. If you would be able to help pop the popcorn, please contact the school office. Thank you! Students will compete in our spelling bee. 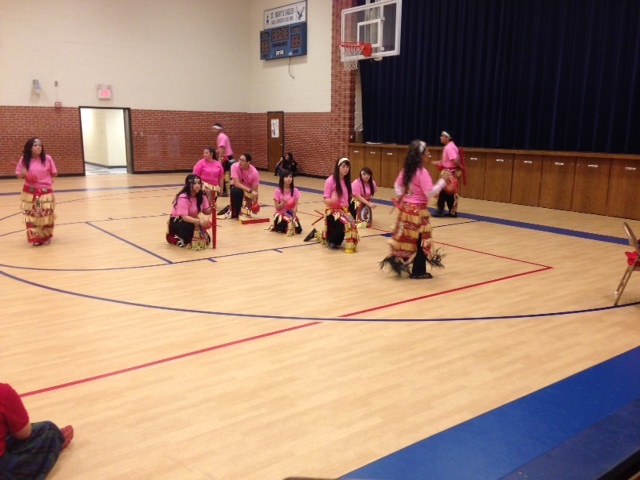 Class representatives from grades 1-4 will compete first followed by grades 5-8. The bee will begin at 12:30pm in the gym. 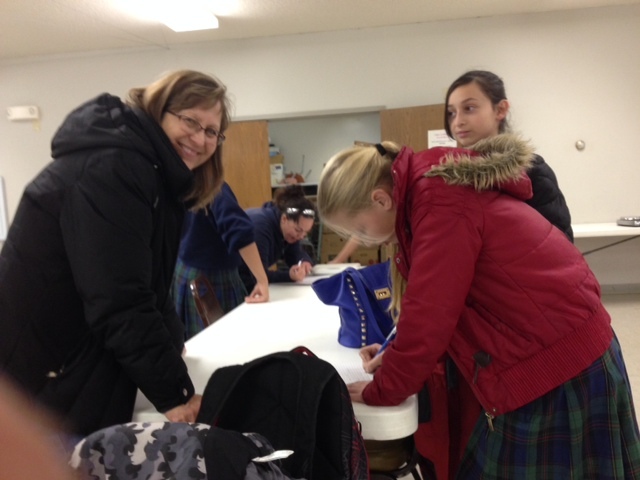 Our 7th-8th grade students will represent St. Mary in the Religion Bowl by competing with students across the Wichita diocese. We will leave at 2:30pm for the competition. Join us for Mass at 8:00am. Friday will be Teacher Appreciation Day! Students may dress in their favorite Kansas attire (favorite school jersey, T-shirt or sweatshirt and jeans – boots and cowboy hats also appropriate). Miss Rodeo Kansas, Abbey Pomeroy will return to St. Mary for a special assembly after Mass. Then come and cheer on your favorite team as the staff challenges the 8th graders in our annual staff vs. 8th grade volleyball game at 2:30pm in the gym. A special faculty lunch is planned for 11:00-12:20 on Friday. If you would be able to help out during this time so the faculty could eat together, please contact the school office. Thank you! All families are encouraged to join in the spirit of the St. Katharine Drexel Walk in Sisters Shoes by decorating a shoe box together as a family and bringing it to school by Friday, January 23 so we can display them at our family lunch. The shoe boxes will be used as centerpieces. Everyday someone brings a donation for the Walk in Sisters Shoes (WISS) from January 6-February 2, a shoe is given to decorate. On the back of this sheet is more information about WISS. Trash bags are now available for pick up from the school gymnasium for school families. They will be delivered by our school families to parishioners and community members very soon. Thank you for your support! Click on the link below to see a video about Catholic Schools in the Wichita Diocese. Thank you for helping our school! 1. Purchase a book at our bookfair. Thank you to our school families who contributed 381 pounds of food to Our Lady of Guadalupe's food pantry just before Thanksgiving. There were 27 middle school students who volunteered their time to load and deliver the food, weigh it, sort it and then shelve it at the pantry. Thank you to Clara Evans for meeting us at the pantry and sharing how the ministry helps those in the Newton area. 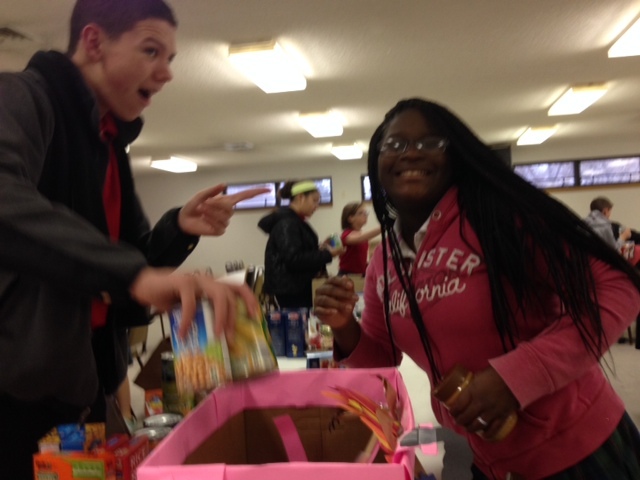 Pictured below are students bringing in food items for the pantry before Mass. St. Mary Catholic School for our food service program. our students and Catholic education! Fr. 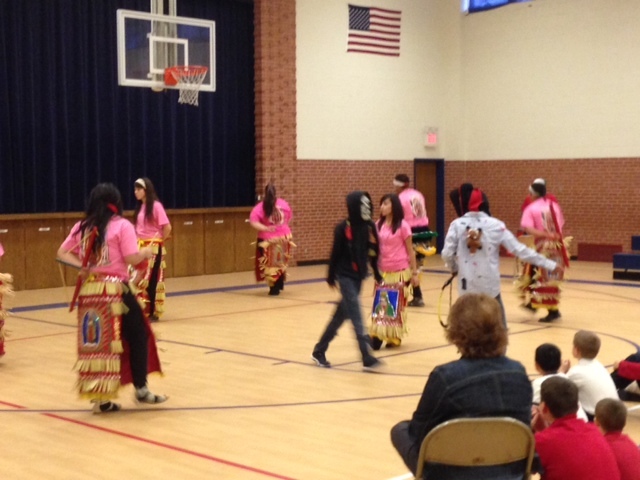 Juan Garza celebrated Mass with our school students on the feast of Our Lady of Guadalupe. 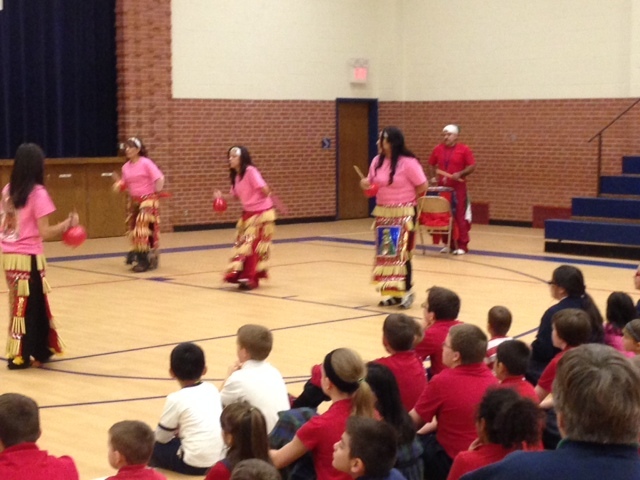 Dancers from the parish came for a special afternoon assembly and told the students about the feast and why they dance. Thank you for sharing your talents with our students on this very special feast day. The 8th grade scholar bowl team finished 9-1 at the Valley Nine Meet in Yoder, taking 2nd place. Team members were Caleb Chaffee, Joseph Mick, Kris van der Weg and Kaitlyn Willis. The 7th grade scholar bowl team took 3rd place at the meet, also earning medals. Team members were Ryan Littlejohn, Brayden Miller, Amber Ruiz and Alyssa Salas. Also pictured is coach Mary Ann Hensley. Our school survey is now open! We value your opinion. Please take time to complete the survey as this helps guide our school strategic planning for the next five years. The link to our school survey is below. Click on the link below. It should take you directly to the site. A Spanish version of the survey will be sent home in backpacks on December 15. 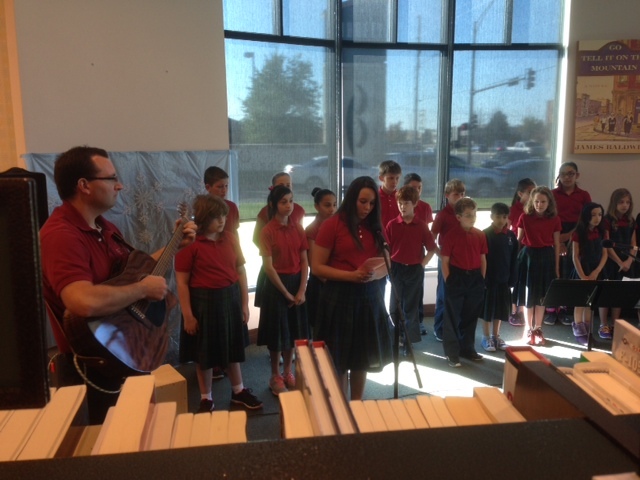 Thank you to everyone who helped support the Drexel Fund book fair for the diocese of Wichita. The fund is named after St. Katharine Drexel. Above students from St. Mary sing for audience members. The book fair helps libraries across the diocese. St. Mary qualifies as a Drexel Fund school because our free/reduced population is 61%. Middle school students and parents help load the food collected the week before Thanksgiving for the Our Lady of Guadalupe food pantry. 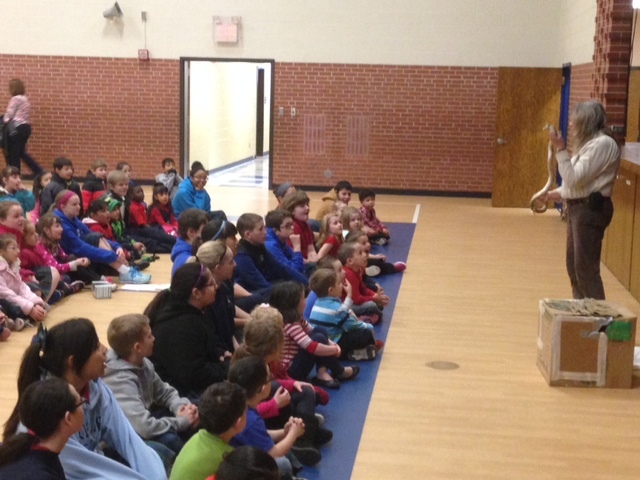 Students at the school collected over 300 lbs. of food. The food was then unloaded and shelved by the middle school group. Clara Evans, the director of the food pantry, spoke with the group about the importance of the pantry to the community. The middle school group which puts faith into action has a monthly outing. Next month, December 15, our outing will be ringing bells and buying items for a family off of the Angel Tree. In January, the group will go to a food handlers class and then serve at the Lord's Diner in Wichita. 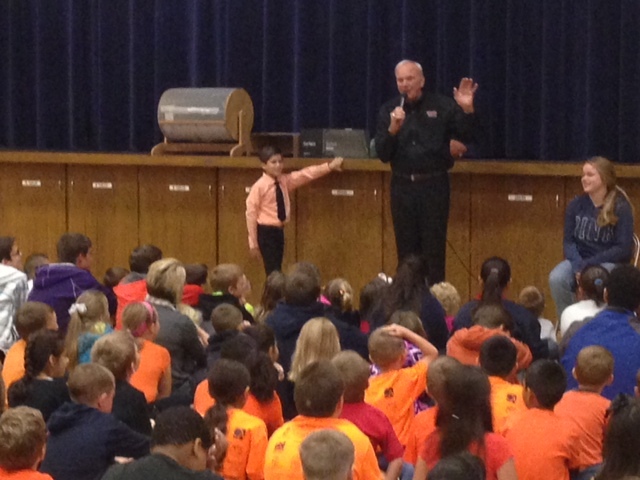 Superbowl Coach and NFL player, Sam Wyche, spoke at an all school assembly about the importance of making every day count at school and using the talents that God has given you. Our principal for the day, 2nd grade student Andrew Guyer, welcomed Mr. Wyche and allowed students to wear orange and black, the colors of the Cincinnati Bengals. 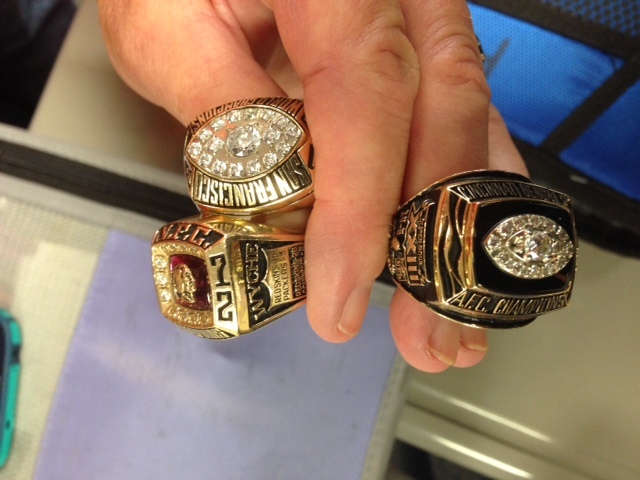 The students were even allowed to try on the three Superbowl rings. Sam had one as a player with the Washington Redskins, one as quarterback coach for Joe Montana with the San Francisco 49ers and one as head coach of the Cincinnati Bengals. 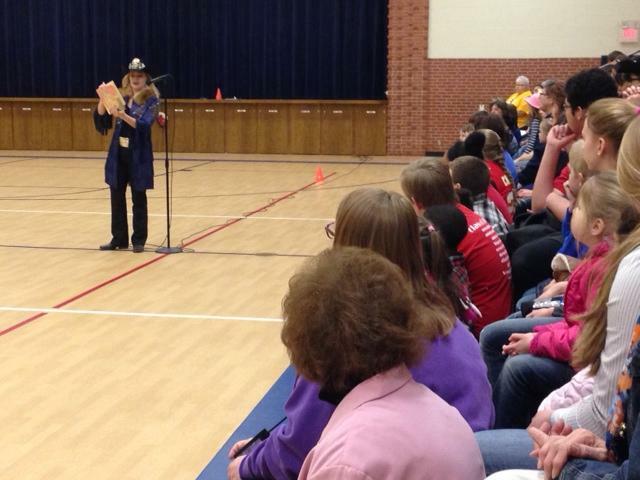 He showed several classes a magic trick, answered questions from students and signed autographs. 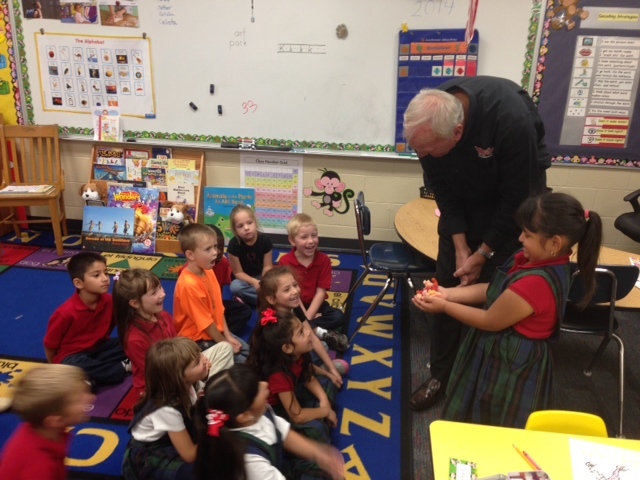 Thanks Mr. Wyche for coming to St. Mary. We enjoyed the visit! We thank Grasshopper Mowers for helping to sponsor the visit. G-Mow also went around to see the students and put smiles on students' faces. St. Mary Catholic School accepted the ice bucket challenge with all K-8 teachers in attendance on 08-28-14. Video is linked at the parish website. The school started with the prayer, the Memorare. Inspired by this confidence,	I fly unto thee, O Virgin of virgins,	my mother; to thee do I come, before thee I stand, sinful and sorrowful. O Mother of the Word Incarnate, despise not my petitions, but in thy mercy hear and answer me. Please continue to keep Vince Garcia and Orva Hargett in your prayers as they battle ALS. 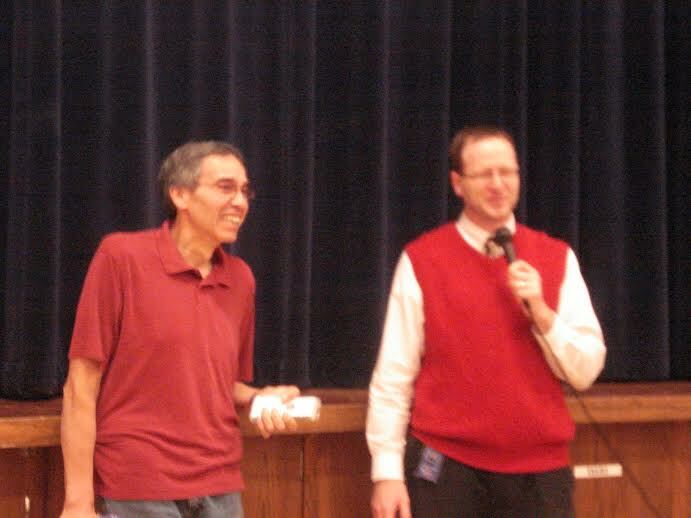 A total of $602.00 was raised and presented to Vince Garcia at our all school assembly on 09-05-14 (pictured below). The picture shows Fr. Scully speaking with the middle school group. Thank you for sharing your message with us! 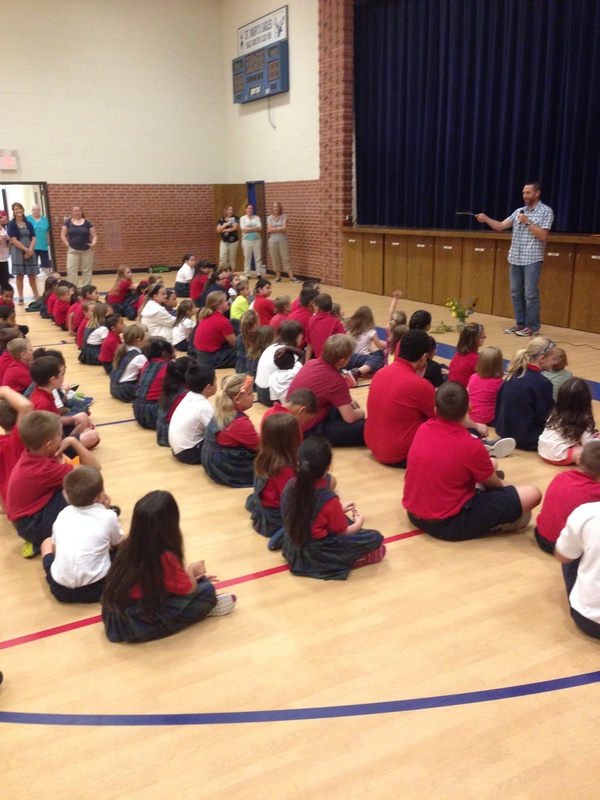 Brad Guyer from the Arboretum came and visited St. Mary on Friday, August 3. He spoke with the students about the prairie garden that was planted by the students last year. Final registration will take place in the school gym on Sunday, July 27 from 9am-1pm. Parker Uniform, food service, used uniforms, yearbooks, fees, a volunteer station and sign up for sports/activities will be set up to make this a one stop for final enrollment. Remember to bring your Parish Family Agreement with you. St. Mary Catholic School would like to welcome Vickie Smith as our new food service director. Geri Scott will help transition Vickie into her new role. We thank Janet Daily for her service to St. Mary and wish her well.